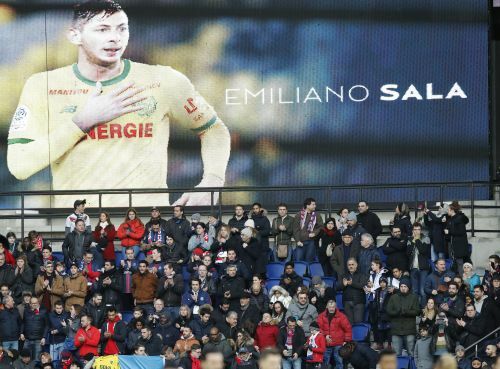 PARIS (AP) — On a day of mourning for Emiliano Sala, Nantes players walked onto the field dressed all in black with Sala's name on their backs as the crowd chanted for him over and over again. "La la la la la la la la, Em-il-ia-no," fans sang, before breaking out in a minute's applause. This was observed at all stadiums in the top two divisions in France this weekend in memory of the Argentine striker who was killed in a plane crash at the age of 28. Players from both sides, some with their heads down in pensive thought, stood in a circle and applauded at the Stade de la Beaujoire before Sunday's game. Then the chanting returned, with a different refrain. "Emiliano Sala, Emiliano, Emiliano, Emiliano Sa-la," the 37,000-strong crowd sang with same unrelenting intensity Sala showed throughout his career with Nantes, Caen and Bordeaux — the club he joined nine years ago after leaving Argentina to forge a career in France. Nimes players wore black armbands on their red jerseys. The referee stopped the game after nine minutes — nine being the jersey number worn by Sala — and the fans chanted his name again as they applauded. Nantes has now retired the No. 9 as a tribute to Sala. Before the game, a giant banner with Sala's face on it was draped over the center circle, while the stadium's big screen showed all the 48 goals he scored in 133 appearances for the club. Sala scored his last goal for Nantes on Dec. 5 in a 3-2 win over Marseille, a typically powerful header from the imposing striker. He was killed in a plane crash in the English Channel last month and his body was recovered from the seabed wreckage this week . Sala had been flying from Nantes to Cardiff, about to start a new career in the English Premier League. At 28 years old, he was at the prime age for a soccer striker. Throughout his career, Sala won respect and admiration wherever he played because of his work ethic and unselfish attitude on the field . Those traits won him the admiration of Nantes coach Vahid Halilhodzic, himself a similarly hard-working striker with Nantes in the 1980s. Sala was the ideal teammate, one who became a friend to several Nantes players. He scored one goal for Bordeaux and then 19 for Orleans, 18 for Niort and five for Caen before joining Nantes in 2015. Sala's last game was against Nimes on Jan. 16.